Live music in Leeds, August 2018. Saturday night at the village has something for everybody! 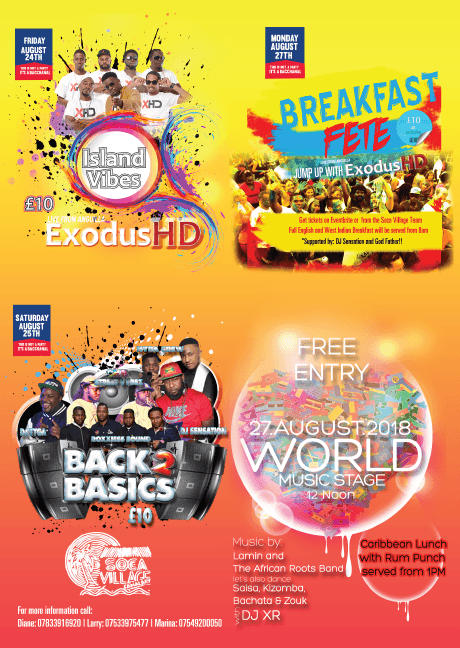 Back 2 Basics – hosted by SENSATION SOUNDS – creates the ultimate party village, bubbling with TIGGA and HYPA CREW from Leeds, headliners STREET VYBZ live and direct from St. Kitts and ROXXIES SOUND from Birmingham. You can’t miss this – The best party in the Ends – Leeds Soca Village – We local, We nice! 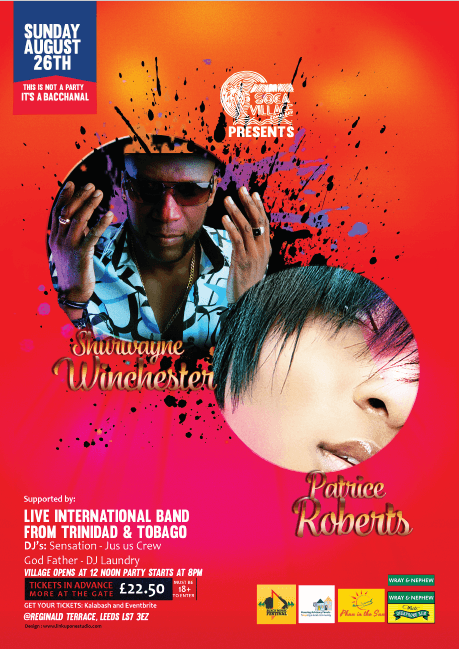 Soca Village Leeds presents Trinidad’s No#1 female Soca Artist – PATRICE ROBERTS and Soca Superstar, SHURWAYNE WINCHESTER – just one night only, performing with a LIVE BAND FROM TRINIDAD – its Leeds Soca Village, Aug 26th – real Bacchanal! Want more? …..indulge in an exclusive VIP section – includes an open bar – all night, Caribbean buffet, exclusive service staff, private bathroom facilities, and luxury furnishings. Book now! 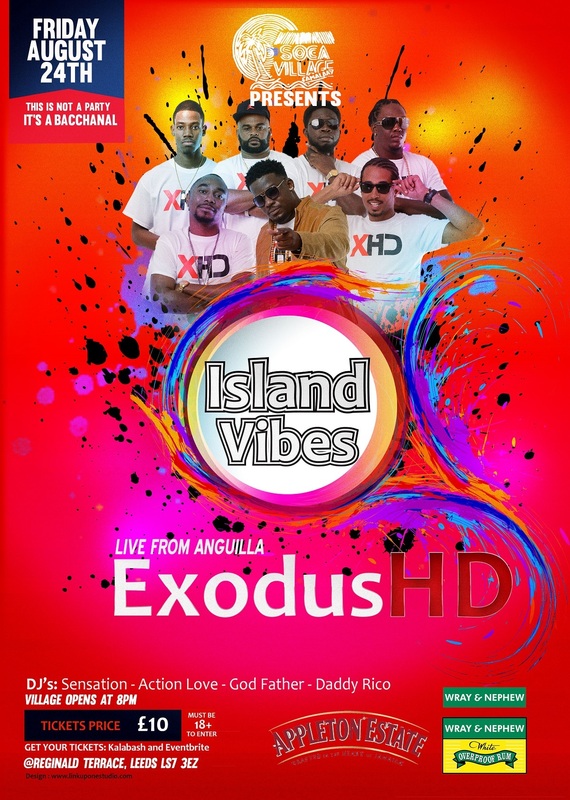 J’ouvert Morning – Breakfast Fete – Soca Village bring in the Jouvert morning, back home style, with a live band – and oh what a band – Exodus HD are the no#1 Road March band in Anguilla – mashing up the road 4 years in a row and will be performing in the village from 9 am. This band is pure ENERGY and will have us all jumping, plus we eating too…breakfast will be served from 8 am – a delicious combination of West Indian and English favourites – everything included in your ticket price. 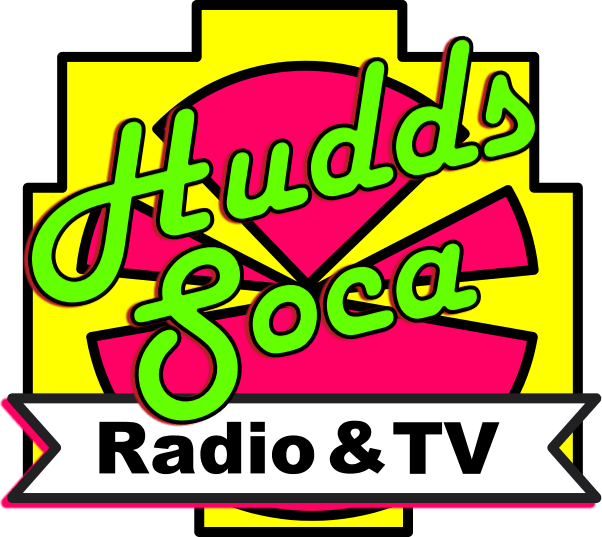 Love the culture – one spot – Leeds Soca Village. This is an afternoon to sit, relax and sip on a rum-punch or two, and take in the wonderful atmosphere of the carnival, without the hustle and bustle. The village serves a Caribbean lunch with a complimentary rum punch or beer from 1pm. 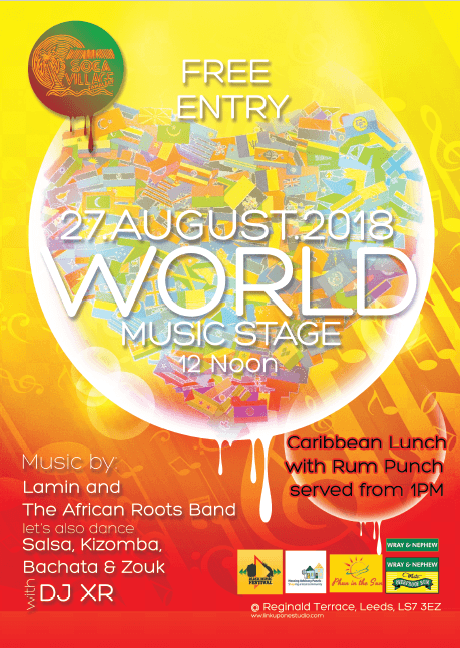 Enjoy the authentic live sounds of Lamin of the African Roots band – providing a selection of African Salsa, Soca, zouk and Reggae accompanied by DJ XR – distinctly latin – with Salsa, Bachata, Kizomba & other latin genres. We’re in no hurry, there’s never any hassle – just great music and the sunshine! Get Soca Village 2018 tickets from Eventbrite.co.uk. Follow Soca Village on Facebook.